Further to information received from reliable sources last year, and published by EE Publishers in an article in September 2018, Standard Bank has now explicitly confirmed to EE Publishers in writing that “as things stand presently, Standard Bank is not involved in the financing of either the Thabametsi or Khanyisa [new coal IPP] projects”. This follows a media release on 15 April 2019 clarifying the Standard Bank Group’s position on financing coal-fired power stations in Africa and globally. In January this year, Nedbank announced its decision to withdraw funding of the Thabametsi and Khanyisa coal-fired power stations, saying that its decision is in line with its commitment to “green” funding, responsible lending and supporting sustainability initiatives. The bank said its initial proposal for funding the construction of the Thabametsi and Khanyisa independent power producers (IPPs) had lapsed and would not be renewed. This was followed shortly thereafter by an announcement from FirstRand Bank which said it had withdrawn from funding the Thabametsi project in which it was initially involved. Although Standard Bank has only now explicitly confirmed it, in September last year the bank reportedly advised the director general of the Department of Energy (DoE), Thabane Zulu, that its new policy position would prevent it from funding the construction of any new coal-fired power plants, in line with new Organisation for Economic Co-operation and Development (OECD) country protocols to which the bank is committed. The Thabametsi 557 MW plant would be largely owned by Japan’s Marubeni and South Korea’s Kepco, and was to be built near Lephalale in the Limpopo province. The Khanyisa 306 MW plant was to be sited near eMalahleni in Mpumalanga province, with the biggest shareholder being Saudi-owned ACWA Power. Although no public statement has been forthcoming from ABSA as yet, it is likely that it will adopt the same attitude towards the financing of these projects because South African banks appear to be falling in line with new OECD country protocols which prohibit the construction of new coal-fired power plants other than those which will use the latest ultra-supercritical (USC) steam-generation technology, which provides increased efficiency (typically greater than 45%), and lower CO2 emissions. The Thabametsi and Khanyisa plants are designed around circulating fluidised bed (CFB) boiler technology operating at sub-critical pressure and temperature, giving efficiencies of about 32%. There are also a number of legal challenges to the Thabametsi and Khanyisa projects, which have still not achieved financial closure after almost two years since being announced as the successful bidders by the DoE’s IPP Office. It therefore seems highly unlikely that the proposed new independently owned coal-fired power stations will be built. The DoE’s draft Integrated Resource Plan (IRP) for electricity, issued for public comment in 2018, included 1000 MW of new coal power in the country’s energy mix. 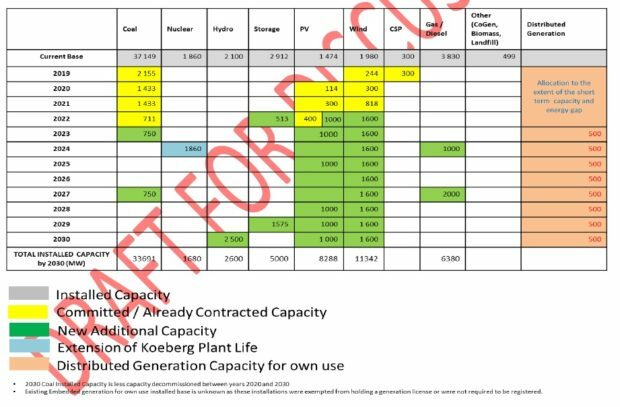 According to page 41 of the draft IRP2018, 12 000 MW of coal-powered electricity generation will be decommissioned by 2030, with only a further 6021 MW added, of which 5021 MW is already committed and under construction via Eskom’s Medupi and Kusile projects, and the further 1000 MW coming from the Thabametsi and Khanyisa projects in 2023 and 2024. Fig. 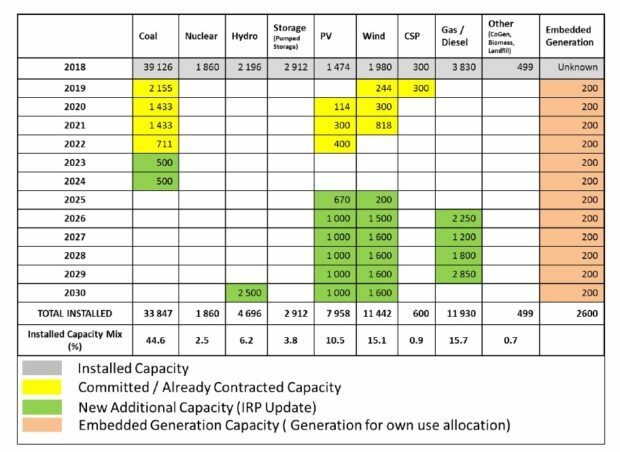 1: Table 7 from the original Draft IRP2018 showing the originally proposed generation technology mix (Source: DoE). However, funding new coal projects may prove to be extremely difficult or expensive as more and more financial institutions, including most of South Africa’s commercial banks, have stated publicly that they will not fund new coal-fired projects using sub-critical steam generating technology, because of the environmental harm such projects impose upon the climate, the country and its inhabitants. Following the public hearings on the draft IRP2018, the DoE issued an Updated Draft IRP2019 on 5 March 2019 for review by Nedlac, which shows some changes made to the proposed generation mix (see Fig. 2). This Updated Draft IRP2019 not only retained new coal in the mix to 2030, but increased it by 50% to 1500 MW (i.e. 750 MW in 2023 and 750 MW in 2027). Fig.2: Table 5 from the Updated Draft IRP2019 showing the new proposed generation technology mix (Source: DoE). A major study has shown that over their 30-year life, Thabametsi and Khanyisa would emit some 200 Mt CO2e, putting their emissions per kWh generated among the very worst and oldest of Eskom’s existing non-compliant coal-fired power plants. It seems therefore that these two independently owned coal-fired power stations might never be built given the difficulties the owners face securing financing, and the potential court challenges in progress. The question which should be asked, therefore, is: why did the DoE include these two new coal-fired power stations in the latest Updated Draft IRP2019 in the first place? The post Standard Bank withdraws funding of new coal IPP projects in SA appeared first on EE Publishers.